Necromancers are enemy spellcasters who specialize in Conjuration, particularly in the semi-legal school of necromancy: reanimation and suspension of the dead. They can be found in Warlock lairs or gathered around ritual or burial sites in the wilderness, frequently accompanied by skeletons or other undead, and will summon more undead allies when in combat. These mages belong to the Conjurer NPC class. The type of necromancer you encounter depends on your level. You will continue to meet low-level necromancers even at high levels, but boss-level necromancers will always be at the highest possible level. Necromancers rely on their reanimated allies and Destruction spells in combat, and carry a leveled dagger in case of close-quarters fighting (iron, steel, orcish, dwarven, elven, glass, or an enchanted dagger of any quality from iron to Daedric). They wear a pair of boots along with necromancer robes, hooded necromancer robes, robes of Alteration, robes of Destruction, robes of Restoration, or robes of Fortify Magicka Rate. In addition to the gear listed above, necromancers have a small chance to carry potions, poisons, soul gems (including a higher chance for black soul gems above level 20), Novice or Apprentice level spell tomes, ingredients (common, uncommon, or rare), recipes, and a small amount of gold. 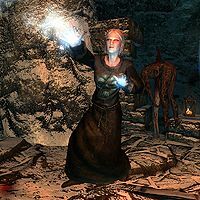 Master Necromancers and Arch Necromancers have the same gear as lower-level necromancers, but have a 50% chance to carry a Staff of Chain Lightning, Staff of Fireballs, or a Staff of Ice Storms. Arch Necromancers do not have the chance to carry additional soul gems. Apprentice Necromancer bosses have the same inventory as the lower-level necromancers listed above. Necromancer Adept, Necromage, Ascendent Necromancer and Master Necromancer bosses have the same inventory as the Master Necromancers and Arch Necromancers listed above, with the exception that Necromancer Adepts and Necromages have a 50% chance to carry a Staff of Firebolts, Staff of Ice Spikes, or Staff of Lightning Bolts rather than a Staff of Chain Lightning, Fireballs, or Ice Storms. These four necromancers are found accompanying the Ritual Master at Wolfskull Cave during The Man Who Cried Wolf. The group includes a Breton woman (0009655b), a Dunmer woman (000e1036), a Nord woman (000e1037), and a Nord man (000e1049). They will have the same leveled stats as a generic necromancer of the appropriate level, but are all named "Necromancer". 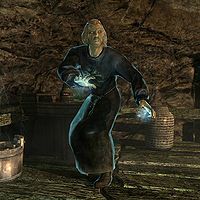 Ancestral Worship: Help Golldir save his aunt and stop a necromancer from defiling his ancestral barrow. The Black Star: Help find and repair Azura's Star. The Savior of Selveni Nethri: Help a necromancer escape from Southfringe Sanctum. Toying With The Dead: Retrieve a necromancer's journals for an interested buyer. Most necromancers have a morality of "Any Crime", which means they're willing to commit any crime. The necromancers found at Wolfskull Cave, however, have a morality of "No Crime," which means they are unwilling to commit crimes of any sort. Their aggression is still very high, though, so they will attack you on sight regardless. All the generic necromancers that are Bretons are listed twice in the leveled lists, which means necromancers are slightly more likely to be Breton than one of the other races. 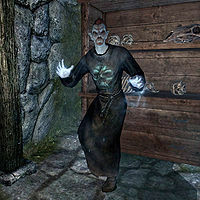 For more information on necromancy in the Elder Scrolls universe, see the lore article. Necromancer's Letter — A letter about Necromancers taking over Fort Snowhawk.